Trestle tables have been a popular part of American homes ever since there was an America. And with good reason. The unique design of this table was comfortable in Colonial homes two-hundred years ago; and with just a few changes, it fits right in with contemporary surroundings today. In short, it has stood the test of time. We decided to take a rather contemporary approach to the design of the trestle table shown here. Yet, to build it, we went back to the old-time methods: the table top is planed by hand. The other problem was simply a matter of money. I wanted the top to look thick and sturdy, but 1 didn't want to spend a small fortune on lumber. So, I cheated (just a little) and built the top with 4/4 (»Vie" thick) lumber and added "thicknesser" strips to the edges to beef them up and give the appearance of a much thicker top. However, the way these strips are glued together does make a difference. When I'm dealing with a surface this large, and I know I want to hand-plane it, I do everything I can to reduce the amount of effort involved to get a flat table top. In this case, I used splines to align the top surface of all the boards. I also arranged the boards so the grain on each one was going in the right direction to make planing easier. (This procedure is described in more detail in Shop Notes, page 22). trim ends. After the boards are glued and clamped together, I wound up with a ragged arrangement of ends that had to be trimmed square. To do this, first I marked lines 56" apart (the final length). Then I cut them off with a circular (Skil) saw7. plane smooth. Now the real fun begins. I used a jack plane to rough down the top, planing directly across the grain to remove any variation between the surfaces of the boards. Then I switched to a jointer plane (although a jack plane could be used here) to plane with the grain. After some amount of work, I finally got both sides of the table top smooth. Now the thicknesser strips can be added. Two of these strips (B) are glued to the side edges of the table top to make it look thicker. They're ripped to a width of 2Yz" and then glued and clamped to the edges of the table top. After the glue is dry, this double-thick edge can be planed smooth. end strips. The other two thicknesser strips (C) are mounted at each end of the top to help support the end caps. However, these strips can not be glued down. The table top must be free to move (expand and contract) with seasonal changes in humidity. To allow for this movement, I screwed these strips in place using a slot screw-method. 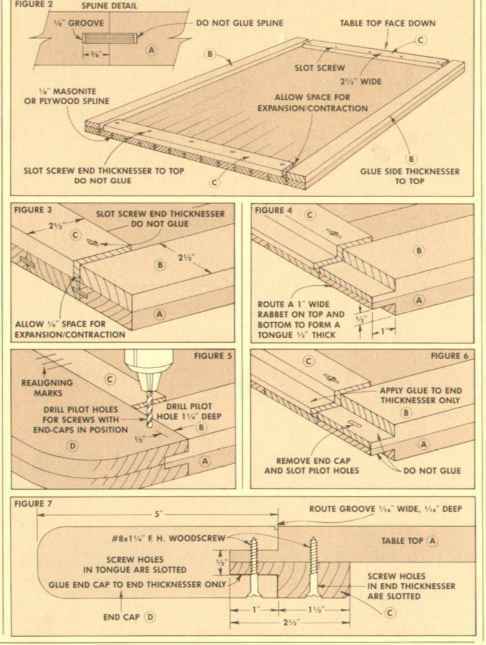 This simply means that a series of pilot holes is drilled to form a slot for the screw, see Fig. 3. This way, as the table top moves, the screws can bend (or shift position) along the slot to move with the table top. These end strips are also ripped 214" wide, but the length should be about Yz" less than the distance between the side thicknesser strips, Fig. 3. This allows a V*" space between the side strips to allow for movement of the table top. After the end strips are cut to size and screwed in place, I planed them flush with the ends of the table top. As mentioned above, the end caps (or bread-board ends) are a traditional feature on trestle tables, but they're a real hassle to mount. The problem has to do with the direction of grain. The grain of the end cap runs at a right angle to the grain of the table top. Thus, the table top will move (in width) much more than the end caps (in length). What this boils down to is that the end caps can not be glued in place. They must be mounted to allow for the movement of the top. There are several methods for mounting end caps to allow for this movement — some good, some not so good. But the one we're showing here is one of the best ways we've come up with to provide the strength needed at the end of the table. The mounting procedure I used is a combination of slotted screws and a tongue and groove joint. This is a rather typical approach. But Ted came up with the idea of adding the end strips (C) to add strength. the tongue. The first step in mounting the end caps is to cut a tongue on both ends of the table top. This tongue is actually the result of cutting two rabbets — one on the top and one on the bottom side of the table top, see Fig. 4.
end caps. Once the tongues are formed, work can begin on the end caps (D). Both end caps are glued up of two 4/4 boards. Then they're ripped 5\wide and cut to length (to match the w™th of the table top). I also rounded the ends to a 2" diameter, see Fig. 5. Now a groove can be cut to fit tightly on the tongue. I cut out most of the waste for this groove on a table saw, and then cut the final groove with a Vz" straight router bit on the router table. Shop Note: I used a Vz" router bit for the final cut because it cuts a flat-bottomed groove with very clean sides. This is also why the tongue is cut exactly Vz thick. 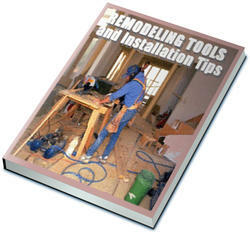 Once the groove is cut, the end caps are joined to the table top with a slotted-screw method. 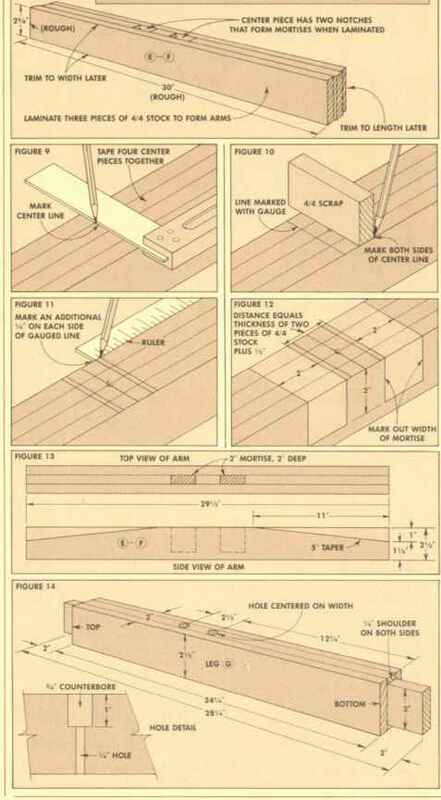 What you're actually doing here is using a screw to "clamp" both sides of the groove (in the end cap) onto the tongue (of the table top), see Fig. 7. Since the end cap remains rather stable in length, slots must be cut in the tongue (which is the part that will move). To do this, slide the end cap in place and drill a series of pilot holes down its length, see Fig. 5. Then remove the end cap and "widen" the pilot holes in the tongue to form slots, see Fig. 6. To give the end cap the added strength (mentioned above), I glued it to the end thicknesser strip (C), but only to this strip. As glue is applied, make sure you don't get it on the side thicknesser (B), or on any other part of the tongue. final steps. Once the end caps are mounted, it's very difficult to plane them to exactly the same thickness as the table top. I got as close as I could, and then used a little trick that really saves a lot of headaches. Using a router with a VW' straight bit, I routed a very small groove between the edge of the end cap and the end of the table top (see Fig. 7). This adds a visual and physical "break" between the change in the grain direction, and makes any variation in the thickness much less noticeable. Finally, I rounded over all the edges of the table top with a router and Vz" corner-round bit. LINE MARKED 4/4 SCRAP WITH GAUGE ">. This table gets its name from the "trestles" that support the table top. Each trestle consists of an arm (E), two uprights (G), and a base (F). (Figure 16 shows what this final assembly looks like.) To build these trestles, I started work on the arms and bases. arms and bases. The arms and bases are identical — a total of four pieces, each one consisting of three 4/4 boards glued together. To build them, first I ripped a total of 12 boards to rough dimensions of 2%" wide and 30" long. mortises. I'd like to say that i chopped out the mortises in these pieces the old-fashioned way — with a mallet and chisel. But that's just too much work, so I opted for a much easier method. Before gluing these boards together, I cut notches in the "middle" board of each three-board assembly, see Fig. 8. When these middle boards are "sandwiched" between the outside boards, the notches automatically form mortises. The notches must be spaced to allow room for the rail that ties the two trestles together. To get the proper spacing, I used a piece of scrap that was the same thickness as the boards for the rail, and marked off this thickness on both sides of the center line, see Fig. 10. Next I wanted to allow for a V*" shoulder on the tenons (on the ends of the uprights), so I marked another set of lines V* to the outside of the first two, see Fig. 11. Once the notches were cut, I glued and clamped each middle board between two outside boards. After the glue was dry, I trimmed the arms and bases to their final dimensions, see Fig. 13.
cutting the taper. All four pieces are gently tapered from the ends to where the upright will be. This taper starts 1" down from the top edge, and ends W out from the mortise, see Fig. 13. To cut this taper I used a taper jig set at 5°. Finally, I rounded off the outside corners on a band saw. the legs. Each of the four uprights (legs) are also glued up of three boards. Once again, I cut a total of 12 boards to a rough length of 25". Shop Note: It would seem much easier to cut the outside boards 2" short and simply leave the middle board "long" to form the tenon. But this can cause more problems than it's worth because the boards are bound to slip around as they're glued and clamped together. the tenons. After the uprights are glued up, I cut the tenons at each end. The critical thing here is the "shoulder-to-shoulder" distance between the tenons. This distance (24V*") must be equal on all four uprights, see Fig. 14. ^After the tenons were cut, I ripped (actually resawed) the uprights down to a 2" thickness (taking Vv? off each face). This makes the uprights about thinner to allow for the chamfered edge on the base and arm. 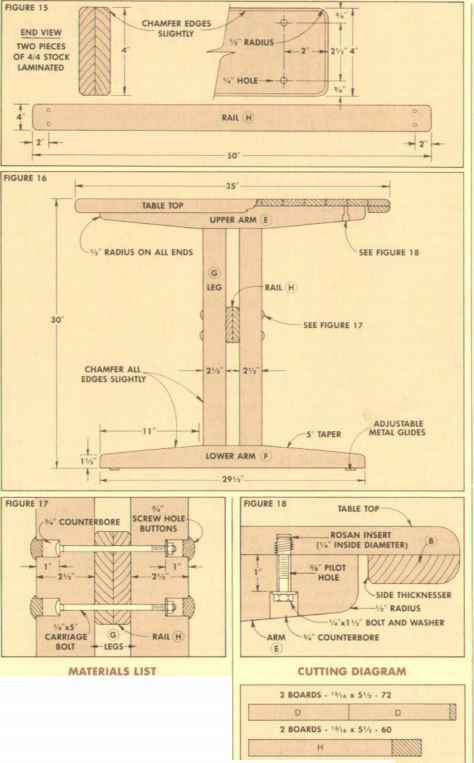 The last step on the uprights is to counterbore two holes in each upright for the carriage bolts that hold the rail in place, see detail in Fig. 14. The rail (H) that ties the two trestles together is glued up of two 4/4 boards, see Fig. 15. After the rail was trimmed to final length and width, I dry-assembled the trestles (the arms, uprights, and bases), and clamped the rails in place. Then I marked and drilled the pilot holes for the carriage bolts. When the rail is mounted between the legs, you may find the fit is not exactly correct. If there's either too much or not enough space between the legs, the tenons can be shaved down a bit and moved one way or the other to compensate. Before final assembly, I knocked off all the edges on all of these pieces (arms, uprights, bases and the rail) with a 45° chamfer bit. Then I finish-sanded everything (including the table top) with progressive grits of sandpaper (starting with 100-grit and finishing with 320-grit). final assembly. Now the uprights can be glued into the bases and arms. After the glue is dry, the rail is bolted between the uprights and then the counterbores are capped with oak buttons, see Fig. 17.
mounting the top. Finally, to join the table top to the trestles, 1 drilled holes in the underside of the table top for rosan inserts, see Fig. 18. Then I counterbored holes in the arms for W hex-head bolts. However, to allow for movement of the table top, the pilot holes for these bolts are drilled oversize (%"). finishing. Since I built this table with oak, I decided to apply filler to all parts. One of the few fillers that's compatible with polyurethane is Behlen Pore-O-Pac paste wood filler. 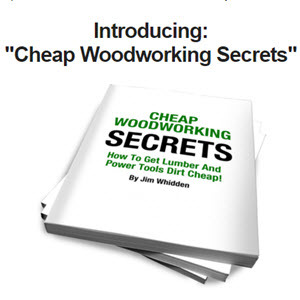 (Available from Woodcraft Supply catalog, No. 08N31-EZ, $9.75 per quart.) After the filler wras dry and sanded smooth, I finished this table with Minwax polyurethane. End Caps (D) — two boards each. Arms (E) — three boards each. Bases (F) — three boards each. Uprights (G) — three boards each. Rail (H) — two boards.